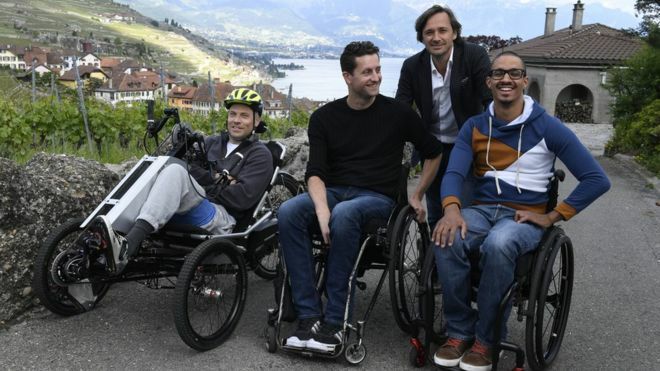 Thanks to new electrical spinal implants developed by Swiss doctors, three men thought to be paralyzed for life can now walk again, and others may follow. The device, developed by a team of doctors at the Swiss École Polytechnique Fédérale de Lausanne (EPFL), recently went through a clinical trial, the results of which were recently published in the journal Nature. The device is embedded in the spinal cord and works by boosting the electrical signals sent from the brain to the legs. In a surprising development, the device also helped to rebuild some damaged nerves, allowing participants to take a few steps even with the device turned off, a development that could mark a major leap in treatment for paralyzed patients. One of the participants, David, marveled at his progress: "To me it means a lot. I'm surprised at what we have been able to do. I think you've got to try the impossible to make the possible possible." At one time told he would never walk again, David can now walk up to half a mile with the device turned on. Researchers plan to undergo wider human trials in Europe and the U.S. with hope of widespread use in the future. The device, currently helping a few patients take small steps, could result in a giant leap in the near future.